Postoperative pain management for living liver donors has become a major concern as a result of the increasing number of living liver donations. Transversus abdominis plane (TAP) block has been known to provide effective analgesia for abdominal surgery. 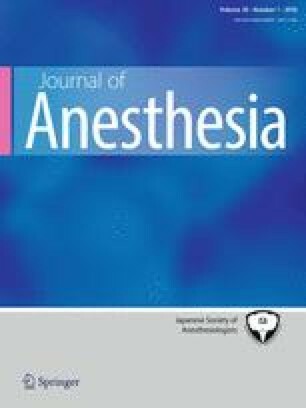 The aim of this study was to evaluate the efficacy of ultrasound-guided continuous subcostal TAP block as a part of a multimodal analgesic regimen in comparison with conventional intravenous (IV) fentanyl-based analgesia in living liver donors. Thirty-two donors were retrospectively classified into either the continuous subcostal TAP block group (TAP group) or the IV fentanyl-based analgesia group (control group). TAP group donors received bilateral continuous subcostal TAP infusion of 0.125 % levobupivacaine at 6 ml/h. Control group donors did not receive any neural blockade. Cumulative fentanyl consumption was significantly lower in the TAP group for 48 h (P < 0.01) as compared to the control group. Further, the donors in the TAP group had significantly lower incidence of nausea and vomiting during 24–48 h postoperatively (P < 0.01) and fewer delays in the initiation of oral intake than those in the control group (P = 0.02). In conclusion, continuous subcostal TAP block provided an effective opioid-sparing analgesia for living liver donors. An erratum to this article can be found at http://dx.doi.org/10.1007/s00540-016-2144-y. We are grateful to all the nurses, surgeons, anesthesiologists, and other staff who made the study possible. This research received no specific grant from any funding agency.